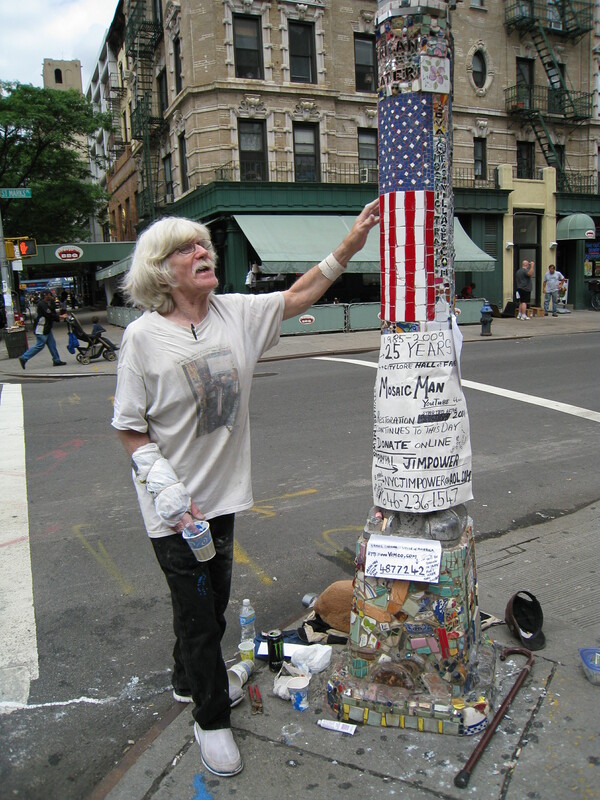 I finally met Jim Power, the Mosaic Man of the East Village. For the past 22 years, and without any official support (read: funding), he’s been decorating the lamp posts of the East Village with elaborate mosaics. This is not just a decorative exercise: the mosaics contain detailed references to the history and landmark of the New York, and are a conscious attempt to preserve the history and character of the neighborhood. Today he was working on repairs to a lamp post that he first worked on 22 years ago. In spite of his age, and the time he’s already spent on the project, he’s got big ideas: he wants to restore the giant mural on the floor of the US pavilion from the World’s Fair in Flushing, and he wants to create a series of pavement mosaics on Allen Street, working with Chinese artists. To do this, he needs some support (both moral and financial), and there are ways to provide both. They’re on the sign in the picture, but I’ll repeat them here: his PayPal username is jimpower and his phone number is (646) 236-1547. He likes hearing from people who donate. Next time you’re in the East Village, pay closer attention to the mosaics on the lamp posts – they tell all kinds of stories. If you want to help out, now you know how!